Last year, Fred Phelps called Tyra Banks a fag enabler when she interviewed him and his two freaky daughters on her talk show. Well, hell! I know I'm a fag enabler. Most of my friends are fag enablers. I guess the folks at Translucence are fag enablers, too. 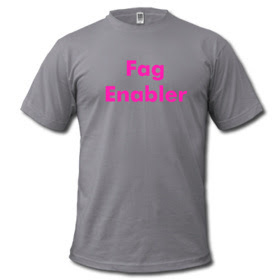 They were so tickled by this label that they went out and made all us fag enablers some kicky fag enabler t-shirts. Click here to buy yours!